Since 2010, we have been organising an International Meniscus Meeting every three years. The first three editions in Ghent, Versailles and Porto were a great success. 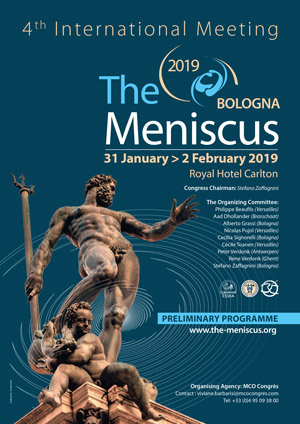 The fourth edition will take place in Bologna, Italy, from January 31 to February 2, 2019: “The meniscus 4”. Professor Stefano ZAFFAGNINI , our prestigious local host, will chair the meeting. We are confident that this congress would offer the perfect platform for orthopaedic surgeons and researchers. We will exchange professional scientific knowledge and valuable clinical experiences around meniscus and cartilage. A lot of experts, coming from Korea (a very “famous Meniscus country”), USA, Australia, Japan and Europe will be present during these three days, and will cover anatomy, biomechanics, biology, diagnosis, outcomes, indications, economic issues, future trends. We really look forward to meeting you in Bologna and sharing outstanding time in this very beautiful Italian city.